Indian authorities have taken to shutting off the internet at the slightest hint of political unrest, said Geetartha Pathak in Telangana Today (India). 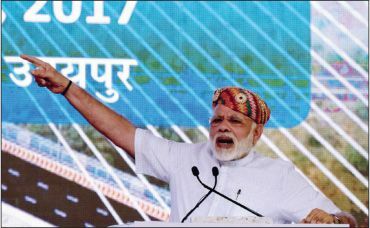 Not content to merely censor TV and pressure the print media, the government of Prime Minister Narendra Modi has ordered or allowed state authorities to disconnect the internet more than 50 times this year. In the whole of 2014, the year Modi came to power, there were only six shutdowns. Officials say that switching off the internet can help maintain public order during a crisis, by preventing rumormongering and incitement to violence. “In a bid to make online censorship permanent,” the Ministry of Communications last month published official rules for shutting down telecom services. There was no public input on the regulations— no consultation with internet providers or advocacy groups, no parliamentary debate—and there is no provision for public accountability. If the world’s largest democracy allows this “outright media censorship,” we won’t stay a democracy for long. The internet shutdown has become a favored tool of “authoritarian repression in Africa,” said Oreoluwa Runsewe in Nigeria’s VenturesAfrica.org. But it rarely has the desired effect. Gambia, Gabon, and Congo all blacked out the internet for a day or more during elections over the past year, saying they feared that agitators would use social media to whip up violence. Riots broke out anyway. In majority-Francophone Cameroon this year, the government turned off the internet for three months in two English- speaking provinces where activists were protesting against language discrimination. The result was to further alienate and anger the Anglophones. Togo recently disconnected the internet for nearly a week to undermine widespread protests against President Faure Gnassingbé, whose family has been in power for 50 years. The demonstrations continued. In India, however, the shutdowns have succeeded in disrupting political expression, said Syeda Ambia Zahan in First Post.com. This summer’s blackout in Darjeeling—where the Nepali-speaking Gorkha people have been demanding their own state—completely “stifled reportage of the unrest from ground zero.” Gorkha activist leader Bimal Gurung was cut off from communicating with his followers and with the media. In Indian-administered Kashmir, not only are forced outages common, said Pathikrit Sanyal in DailyO.in, but also the government instructs social media sites to block the accounts of Kashmiri activists. Clearly, Modi and his allies want “to silence any liberal voice that dares to speak against the prime minister, rising fascism, and the negative effects” of a Hindu nationalist regime.